Aaron Rodgers is hoping to play in time for a playoff push. 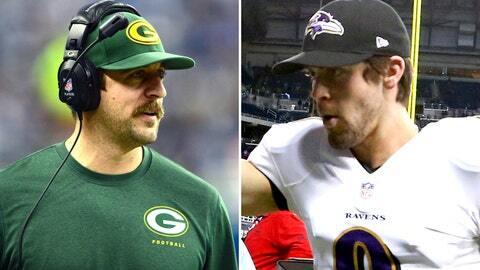 Justin Tucker may have just made that a possibility. So of course the Packers QB paid his just due. With his kicking game for all time Monday night, Baltimore’s Justin Tucker made plenty of new fans, from fantasy football owners to Chicago Bears backers, TV news producers to the common man everywhere. Tucker’s historic night, in which he kicked six field goals including a game-winning 61-yarder to set a number of new standards for kickers, beat host Detroit 18-16 and drop the Detroit Lions to 7-7 on the season, has given the 7-6-1 Packers renewed life. If Green Bay beats Pittsburgh in Week 16 and then Chicago (currently atop the NFC North at 8-6) in the regular-season finale at Soldier Field, the Packers will win the division and host a playoff game. "It’s amazing that we’re sitting here 7-6-1 with a chance to win two and be in [the playoffs]," Rodgers said on his show. Now the big question: Will Rodgers play Sunday at home against the Steelers? The 2011 NFL MVP has been out since suffering a fractured collarbone in Week 9 against the Bears, and his availability is an increasingly hot-button issue. He would not give much more insight on his status for this week on his show. But he did address whether the Packers’ playoff chances after their amazing comeback win in Dallas on Sunday will play a role in his approach to this week, and made it clear that he is itching to play.